All is calm, all is bright…well, at least we can promise the latter with this luminous arrangement! Gather family and friends together for a holiday meal around this traditional Christmas centerpiece featuring pinecones, holly, noble fir and Christmas candles. 'Tis the season to shine! 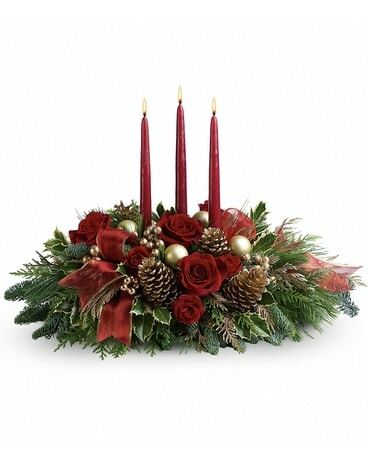 •A fresh centerpiece of holly, noble fir, white pine, flat cedar, roses and spray roses is decorated with golden berries, Christmas ornaments, pinecones and three red taper candles. •A sheer, gold-edged organza ribbon adds to the opulence.